The Silvermine Valley has always been strategic in terms of access to the South Peninsula. The DEIC used the heights above the valley as a ‘buitepos’ lookout from the very early days while the valley itself was used for grazing cattle. Three silvermine shafts were excavated in the area in 1687. Defensive positions were built in 1805 and the first farms in the valley were granted three years later. These enjoyed a reasonable supply of water and became the home of many early Cape families like Kirsten, de Villiers, van Blerk and van der Poll. 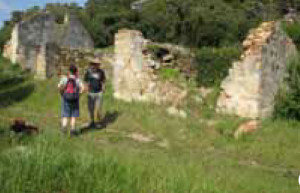 The ruins in the valley, including those of the well-known ‘Kruithuis’, will be explored and an attempt will be made to explain the roles of these structures. Derek Stuart-Findlay will examine the geographic and military significance of the valley in its wider context. Derek was born in Cape Town and has always been fascinated by its early history. He retired from a 32 year career in the property industry and settled in St. James. His interests include the history of motoring in South Africa and he is the author of ‘Our Intrepid Cape Motoring Pioneers’ (2015), a fascinating account of early motoring here. (Copies will be available at the talk @ R250). He is a member, past chairman and historian of the Crankhandle Club. He also co-authored ‘St. James, a place of Dreams’ with Mike Walker.